Kitras Art Glass uses centuries old glass blowing techniques to create these one of a kind pieces of blown glass art. Light this oil lamp and relax as the vibrant colors dance across this burning orb. The fanciful calico splashes of color attest to the lamp's handmade character. Our 6" Oil Lamps come in several color combinations, see our other listings for the other colors as well, if this isn't quite the combination you want. 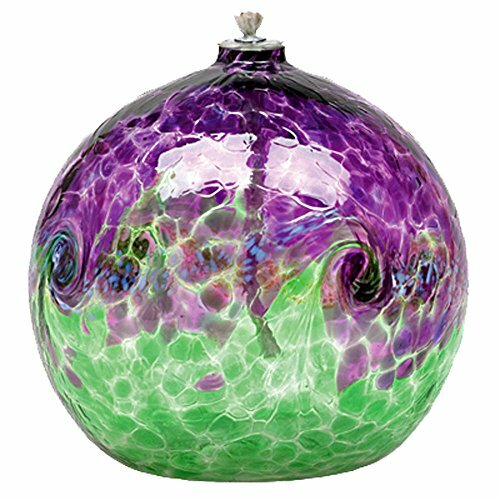 Being hand blown, these orbs vary a bit in size, with a diameter of about 6 inches. You can use any lamp oil meant for such use. It comes with a metal shielded wick. Hand blown in Canada by the skilled artisans at Kitras Art Glass. Kitras Art Glass uses centuries old glass blowing techniques to create these one of a kind pieces of blown glass art. Light this oil lamp and relax as the vibrant colors dance across this burning orb. The fanciful calico splashes of color attest to the lamp's handmade character. Our 6" Oil Lamps come in several color combinations, see our other listings for the other colors as well, if this isn't quite the combination you want. Any lamp oil may be used (even Citronella) for outdoors! Oil Lamps comes with wick, refills available.